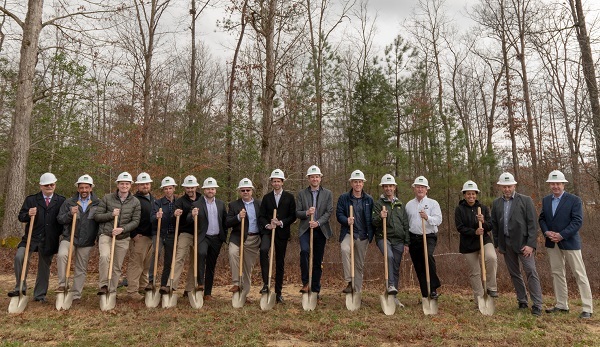 Magnolia Green developer iStar Financial and Delaware-based Schell Brothers broke ground in recent weeks on Glenmoor Oaks, a $40 million, 248-unit apartment complex Schell is developing in a 21-acre section of the 1,900-acre development. On board to build the apartments is Branch Builds, a Roanoke-based builder that Schell selected over two other firms that bid on the project. The firm’s local projects have included The Spectrum Apartments, the Cookie Factory Lofts and Magnolia Green’s golf clubhouse. It also is building George Emerson and Phil Roper’s The Jane at Moore’s Lake apartments. 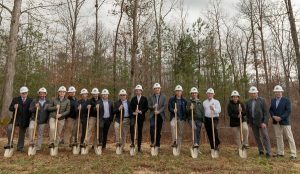 Representatives with iStar Financial, Schell Brothers and others took part in a groundbreaking ceremony last month. Schell Brothers’ Shane Burnette said Branch was selected for the project in light of its previous collaboration with iStar on the clubhouse. “Branch has a great relationship with iStar from the golf clubhouse project and they were very transparent and accommodating to all of our requests during the project negotiations,” Burnette said in an email. Glenmoor Oaks will consist of eight four-story buildings with apartments ranging from one to three bedrooms and in size from about 600 to 1,200 square feet. The complex will include a clubhouse, leasing office, pool, grilling pavilion, fitness center, yoga studio and cybercafé. Construction is getting underway and is set to wrap up in about two years, with the first apartments coming online in early summer 2020. The site is located along Magnolia Green Parkway, across the street from the development’s golf clubhouse and aquatic center. Burnette said monthly rents for the units will be market-rate and set closer to the time of completion. Midlothian-based Poole & Poole Architecture designed the apartments, which Schell Brothers has said mirrors one of its apartment projects in Delaware. With Glenmoor Oaks, Schell Brothers is donning the developer hat instead of its usual role as a builder. The firm entered the Richmond market in 2016. Note: This story has been updated to include comments from Schell Brothers received after publication.